Even the simplest of handbag styles from Betsey Johnson is bound to have a quirky design feature somewhere on its exterior. I'd actually be shocked to see one without some sort of unexpected twist. Enter the heart padlock detail on the front of the Locked In hobo. 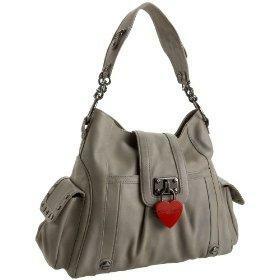 This otherwise relatively normal-looking purse is taken to a new level with an oversized and whimsical heart-shaped pendant hanging from the top flap closure. I'm not entirely certain if it is supposed to signify things being locked inside the handbag or keeping others from accessing what you've got, but either way the funky feature adds personality to the bag. The Locked In collection is also available in a clutch, wallet, or satchel, but the large hobo definitely has its appeal. Although not really what I'd consider a typical hobo shape, the hint of slouchiness gives this purse a desirable casual air. With studded flap pockets on either side and a slip pocket on the front, there's more than enough extra storage space to go around, too. The interior of this Betsey Johnson handbag is lined in the brand's lace-printed lining. On the outside, the heart-shaped padlock detail displays the logo in a rather simplistic way. Overall, I'm rather impressed with the Locked In large hobo and am liking it best in this pretty shade of gray. The Lucky Brand Stash Bag, a great alternative to this large leather hobo.